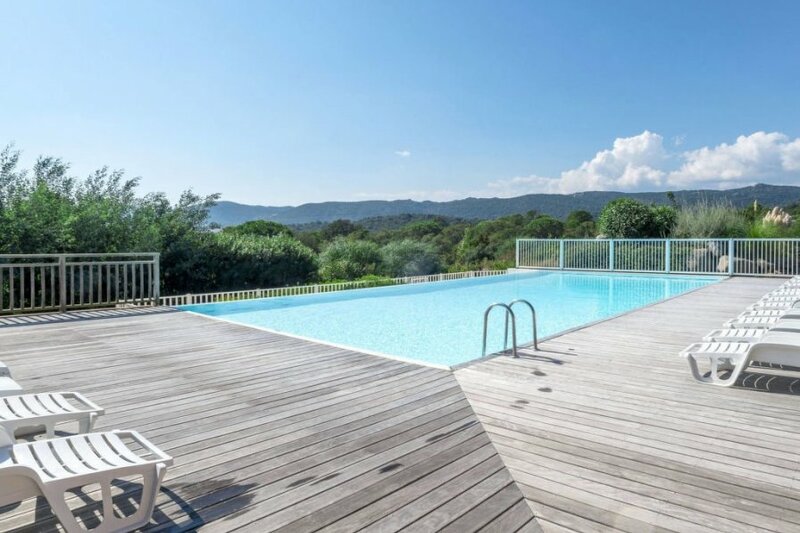 This 2 bedroom apartment with swimming pool is located in Porto-Vecchio and sleeps 6 people. It has WiFi and air conditioning. The apartment is within walking distance of a beach. Terraced house, 4 - 6 people, 3 room/s, 2 bedroom/s, 2 bathroom/s, approximately 60 m², 2 floor/s, south-facing location, panoramic view. Feature: Property in a holiday complex (59 units in total). Furnishing: bright, pleasing, cotto floor. Equipment: TV; washing machine; combined heating/air conditioning. Holiday resort tax. Linen/towels must be brought along. Bed linen available on loan, € 15 per person/​change (on order). Towels available on loan, € 8 per person/​change (on order). Deposit € 450 (Visacard, Mastercard). Cot only within the maximum occupancy, € 15 per week (on request). Pet not allowed. Estate (shared use with holiday guests): approximately 4 ha, in a hillside, terraced, with plants. Pool (shared use): 15.0 x 8.0 m, open throughout the entire season, depending on the weather, secured by a fence. Pool area: wood terrace, sun loungers (depending on availability), external shower. Infrastructure: reception service several hours only; internet access Wi-Fi (included) in the reception area. Plot description: parking near the house. Terrace 8 m², balcony 18 m² (pergola), furnishing provided, brick barbecue. The agent describes this apartment as a family friendly holiday rental ideal for the summer holidays. It is also good value for money. This apartment is located in Porto-Vecchio. The nearest airport is only 3km away. It is set in a convenient location, just 0 metres away from a beach and 8km away from the city center. The apartment has free wireless internet. The apartment is well equipped: it has air conditioning, a dishwasher and a washing machine. It also has a BBQ and a tennis court. There is a trail for mountain biking nearby. The apartment is suitable for family friendly summer holidays.